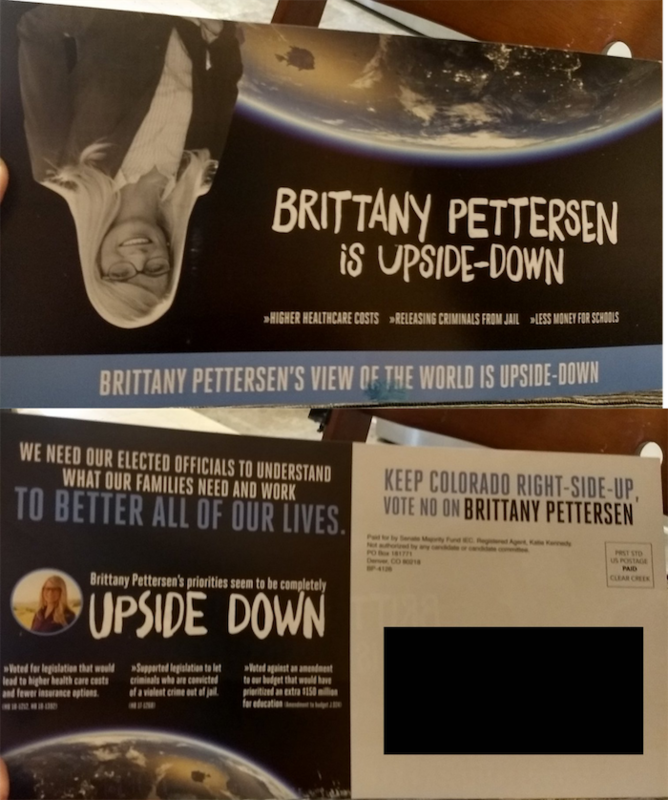 This mailer from Republican super PAC Senate Majority Fund says Democratic state Rep. Brittany Pettersen's "view of the world is upside-down." Pettersen is running against Republican Tony Sanchez for an open seat centered in Lakewood and south Jefferson County. Danielson was among many Democratic co-sponors of a 2017 measure to prevent the state and local government from providing the federal government with information about a Colorado resident's race, ethnicity, national origin, immigration status or religious affiliation. It also would have prohibited holding a person for more than 48 hours or detaining them because of such characteristics. The bill died in the state Senate. Her vote against a budget amendment to increase funding for schools. The measure would have taken money away from Medicaid reimbursments or the state employee pension program, according to the Denver Post. Her votes for licensing requirements for free-standing emergency departments and create a program to help Coloradans with high health-care costs. It aimed to get federal grants to reduce health insurance costs in areas where they are high, and also would have levied a fee on health insurers. Both bills died in the Senate.